October 7, 2015. Doors open at 4pm, show starts at 7:30pm. Archivists take over the popular bar-based monthly lecture series, Nerd Nite Philly. So, you’re a monk in the fourteenth century, and you want to copy a few pages of your favorite hymnal. No problem! First, you catch a goat. Then you skin a goat. Then you find some gall nuts on an oak tree, and some good red wine… okay, you get the idea. Writing and book-making were highly specialized arts requiring patience and expertise. This Nerd Nite, you’ll learn about the process of making manuscripts, and even get to try your hand at writing with real iron-gall ink and feather quills. Tara O’Brien [Historical Society of Pennsylvania] will discuss the history of cursive writing. Maybe we can get her take on the importance of teaching penmanship in Philly public schools? Nerd Nite is a monthly lecture event that strives for an inebriated, salacious, yet deeply academic vibe. It’s often about science or technology, but by no means is it limited to such topics. And it’s definitely entertaining. Our unofficial tag line is “It’s like the Discovery Channel – with beer!” There are Nerd Nites around the world, Philadelphia is just one of them. Take a gander at http://philadelphia.nerdnite.com/welcome/ for more info. No advance registration required, but arrive early to claim a table! Think you know Philadelphia history? Test your knowledge of the City of Brotherly Love in this special pub quiz organized by the Delaware Valley Archivists Group. Questions plumbed from the annals of our city’s past by your friendly local archivists will challenge you to recall the people, places, and events that make Philadelphia unique. Bring your buddies – or make some new friends! – and form a team of up to six players. While the program starts at 7:00 pm, we advise you to arrive early in order to claim your table. 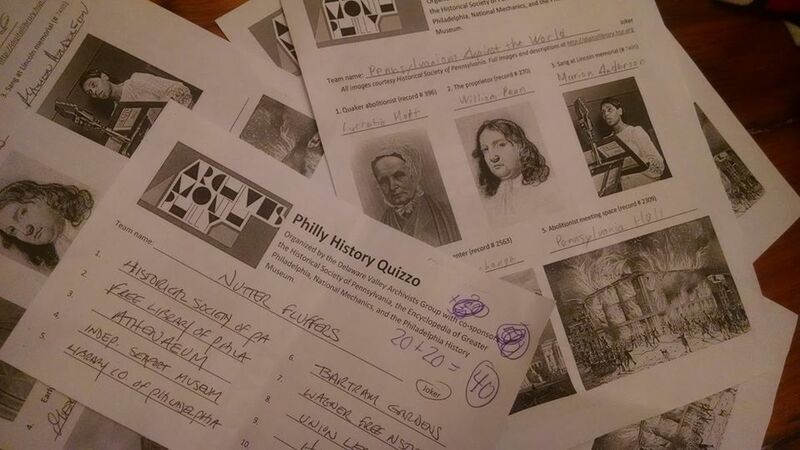 The night’s Quizmaster, a local archivist, will ask three rounds of ten questions each about Philadelphia history. You’ll write your answers on response sheets that will be collected after each round. Prizes will be awarded to the highest scoring teams and to the team with the Quizmaster’s favorite team name. Big thanks to our prize sponsors!